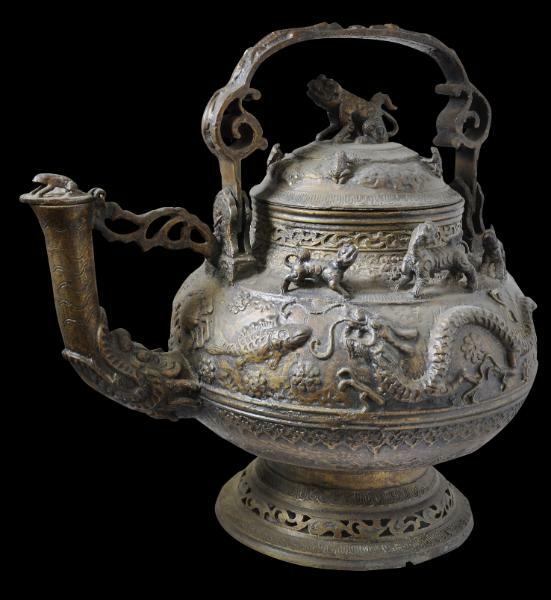 This monumental, massive brass or bronze kettle was cast in the 19th century on Borneo island, most probably in Sarawak state (now a part of Malaysia). 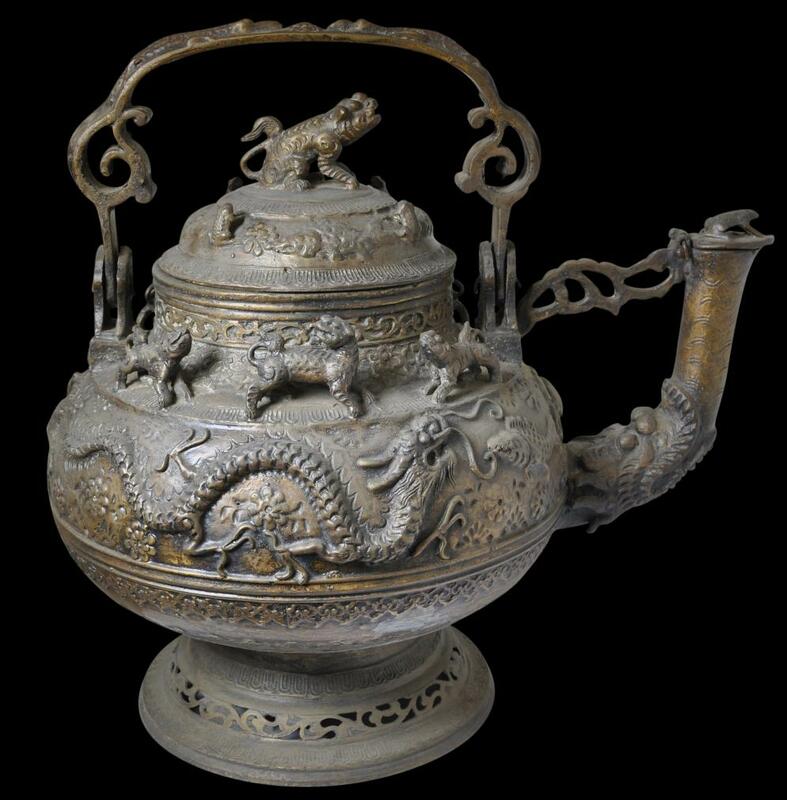 It stands on a wide, pierced foot cast with lotus petal motifs. 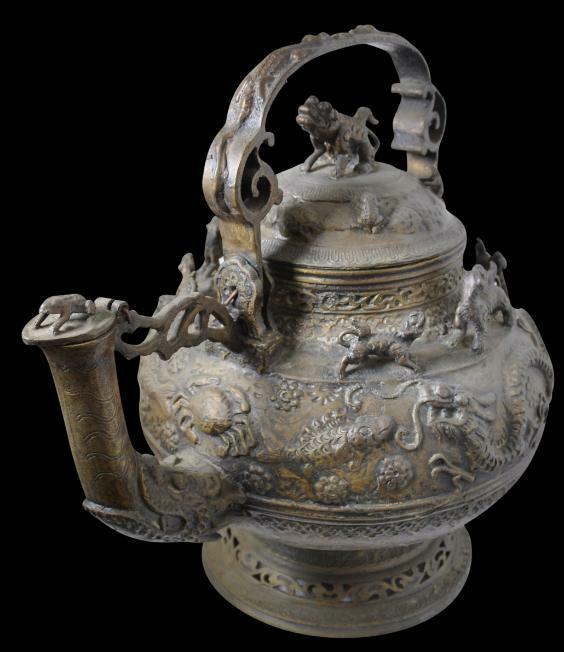 The sides of the body are cast with two dramatic Borneo-type dragons, fish, lotus flowers, a deer and a crab. On the shoulder of the base stand – Dongsan-like – six lion-dog creatures. The lid is domed and cast with four tree frogs spaced at equal distances around the rim. 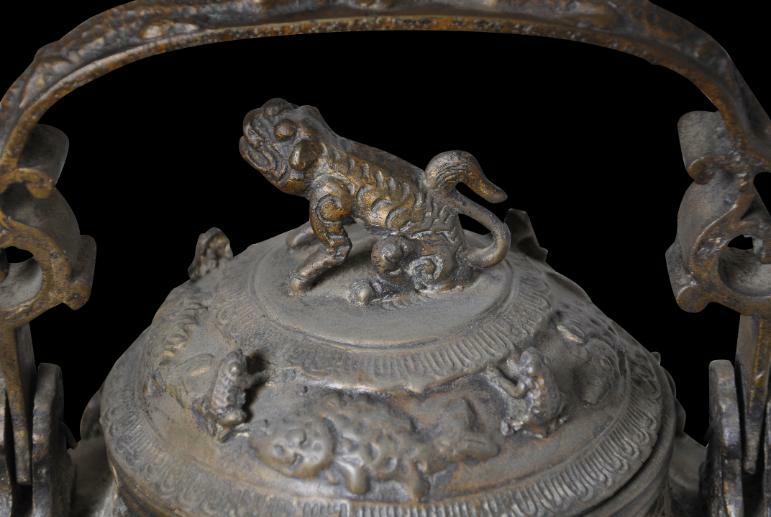 The lid is surmounted by a solid-cast crouching fo-dog figure with a prominent waving tail. A spout is emitted from the mouth of a dragon-like creature and the aperture of the spout is protected by a hinged flap cast with a crouching tree frog. 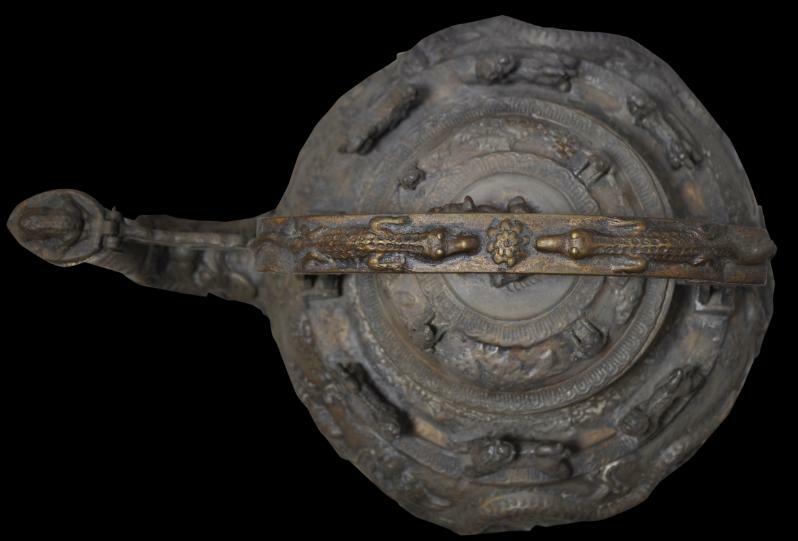 The rococo-esque handle has been cast with two snub-nosed crocodiles that face each other but separated by a water flower. 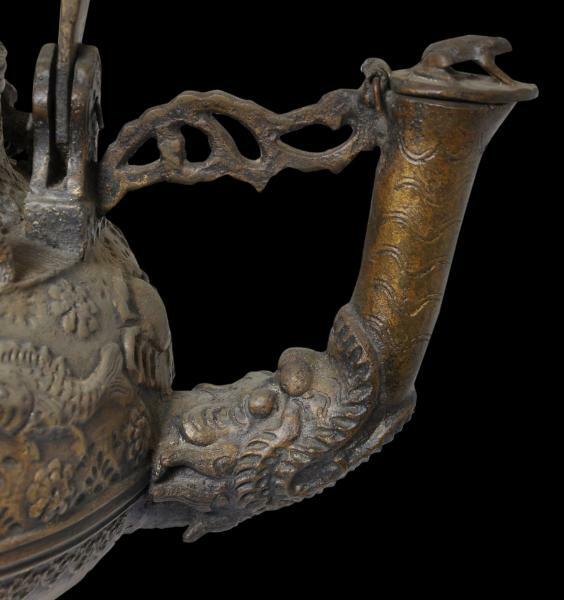 Such a kettle was used not for heating or preparing beverages but for hand washing on ceremonial occasions, particularly by Iban people on Borneo – or it was simply used as a store of wealth, something to be possessed and traded, currency-like. 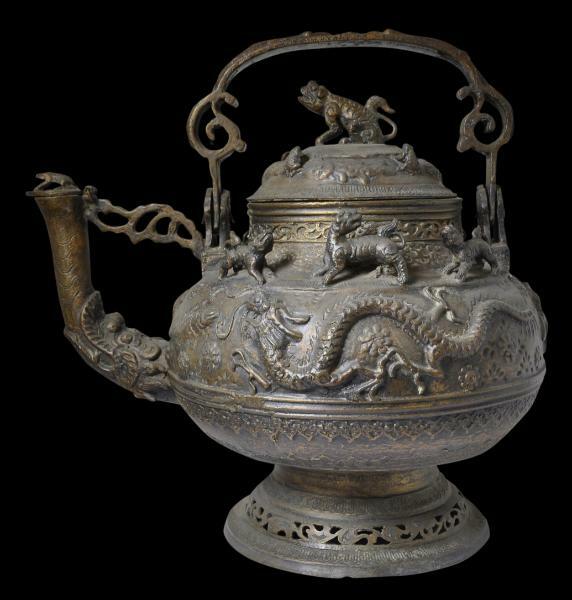 A kettle as large and elaborate as this one would have been used for special feasts only, particularly for weddings where wealth and ostentation needed to be on display, and only in wealthier households. A related example is in the collection of the National Museum of Singapore and illustrated in Singh (1985, p, 22). Other examples are illustrated in Chin (1980, p. 46), and Taylor & Aragon (1991, p. 295). fo dog motifs. Children’s stories that are still told today in Borneo feature tales of Chinese princes and dragons. One tells of a dragon that lives atop Mount Kinabalu (Borneo’s highest mountain) where it guards a magnificent precious stone the size of a peacock’s egg. The Emperor of China hears about the stone and tells his three sons that whichever one of them brings back the stone will be made his heir; the other two will be killed. One son manages to trick the dragon and captures the stone. But the other sons lie to their father that they were the ones to take the stone. Ultimately, the Emperor discovers this deception and the wayward sons escape China, one of whom returns to Brunei and founds a princely dynasty there. The kettle is in fine condition. There are minor casting faults here and there as is typical of Borneo metalwork. The kettle has a varying and dark patina. Chin, L., Cultural Heritage of Sarawak, Sarawak Museum, 1980. 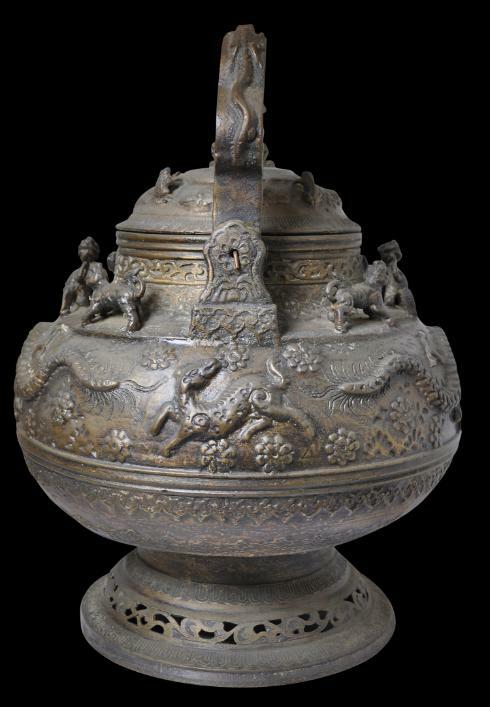 Malay Brassware, National Museum of Singapore, 1985. Beyond the Java Sea: Art of Indonesia’s Outer Islands, National Museum of Natural History/Harry N. Abrams, Inc,1991.